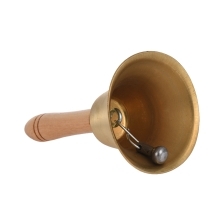 Brass handbell with wooden handle, exquisite workmanship and durable. With metal ball inside, delivers a super loud and clear sound. Can be used for multiple purposes, such as desk ringbell in class, ready signal in restaurant, wedding or festival decoration, pet training, etc. 14.5cm in length and the bell diameter is 8.3cm, compact size and lightweight.